When it comes to legendary British guitar tones few pedals can compete, historically, with the Dallas Rangemaster. Eric Clapton, Billy Gibbons, Marc Bolan, Ritchie Blackmore, Rory Gallagher, Toni Iommi and Brian May of Queen have all used the Rangemaster. 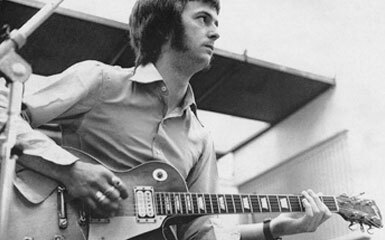 Eric Clapton was probably the first guitarist to overdrive a Gibson Les Paul through a Marshall amplifier with John Mayall’s Blues Breakers in 1966. Listen to Eric Clapton using a Rangemaster into a Marshall JTM45 model 1962 2×12 here. If you’ve invested in some serious amplification, such as the Louis Electric Bluesbreaker, it would be foolish to compromise when selecting a clean boost pedal – ideally you want to amplify your signal transparently, without adding unnecessary colour, harmonic or distortion characteristics to your sound / tone. 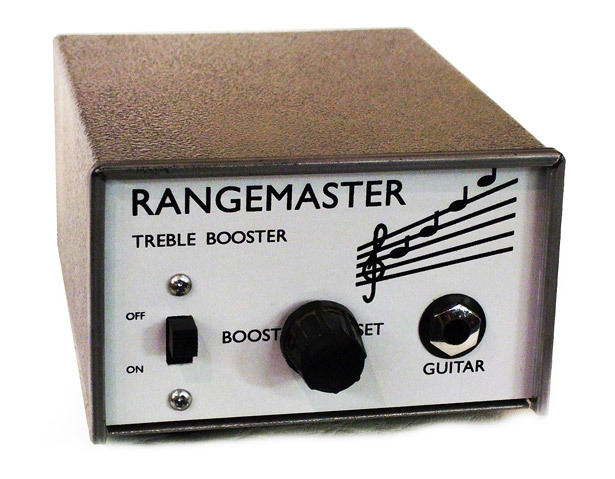 Despite its name the Rangemaster Treble Booster is actually a selective frequency booster – the higher the frequency you select, the greater the range and the greater the boost delivered. The sound is rendered brighter but not in an atypical way – the bass and low end remain intact whilst the high end is lifted as you move up the neck through an increase in sustain and gain. Here are some of the best Rangemaster clones out there right now: serious, high quality, hand built with high end feature sets and quality components. These pedals will help you achieve the guitar tone heard on John Mayall’s Beano Blues Breakers album with Eric Clapton and other classic British recordings. These Boost Switch pedals use only genuine New Old Stock – in this case an authentic forty year old Mullard OC44 PNP germanium transistor. Each unit is built by hand and individually tested by Boost Switch with a no-nonsense 30 day return period and one year guarantee. What makes the Tonemaster so essential is the fact that it not only boosts the signal of your guitar as you move higher up the neck – the harder you hit the guitar strings also creates a naturally augmented shift from subtle soft clipping towards a harder overdrive and Boost Switch individually bias EACH Tonemaster to replicate the authentic tone of the Original Dallas Rangemaster. Blue LED indicator and blue non-slip rubber backing. The Boost Switch website is here. Michael Swart’s preference is for vintage Fender, Ampeg and Vox amplifiers but he always felt he wanted something more and began building his own tube amps. Nowadays Michael Swart is a world reknowned vintage amp sound specialist responsible for building amplifiers of exceptional quality including the highly prized Swart Space Tone amplifier – an amp that delivers superlative vintage tones and distortion characteristics in a small home and studio package. The Swart website is here. Internal Power Supply Boost – turns your 9 volts into 18!!! The power supply’s high voltage is what leads to this super clean headroom pre-amp. Sound like rack or studio gear! JFET design – clean tones, tube like when they overdrive or clip. Metal Film Resistors and Caps. Ultra Low Noise Design. Blue LED, a Keeley Trademark! 9 volt DC jack or Battery operation. DC jack at top of unit like Boss or Ibanez effects. Low current draw of 7.5mA . The Keeley website is here. 4. Analogue Man Beano Boost. Analogue man reverse-engineered and studied their original Dallas Rangemaster as opposed to simply copying the schematics which are available on DIY effects pages and their Beano Boost is built with the original style point-to-point wiring rather than on a circuit board. NOS Germanium Transistor chosen for low noise and best tone. Middle: “HI” Standard Dallas Rangemaster tone, treble enhanced. Up: MIDs, more of a full range boost, great for Fender guitars! Down: LOW, full range sound with a bit more bassy setting. Down: “HI” Standard Dallas Rangemaster tone, treble enhanced. * This can be reversed at order time if desired, or changed to MID and LOW settings. Volume Control allows substantial boost. Can boost volume quite a bit. Has about the same output level ON and OFF with the vol knob set at 9:00. At 11:00 there is about a 10dB boost, which sounds twice as loud. At 12:00 there is a 13dB boost, and up all the way is about an 18dB boost which is nearly twice as loud as it was at 11:00. Durable Grey Hammertone (like original) powdercoated cast alloy case. Circuit hand-wired point to point like the original. No circuit board used. When power jack is added, it can use any normal Boss type 9V power supply, with no reverse polarity issues. We add circuitry to reduce power supply noise when the power jack is added. 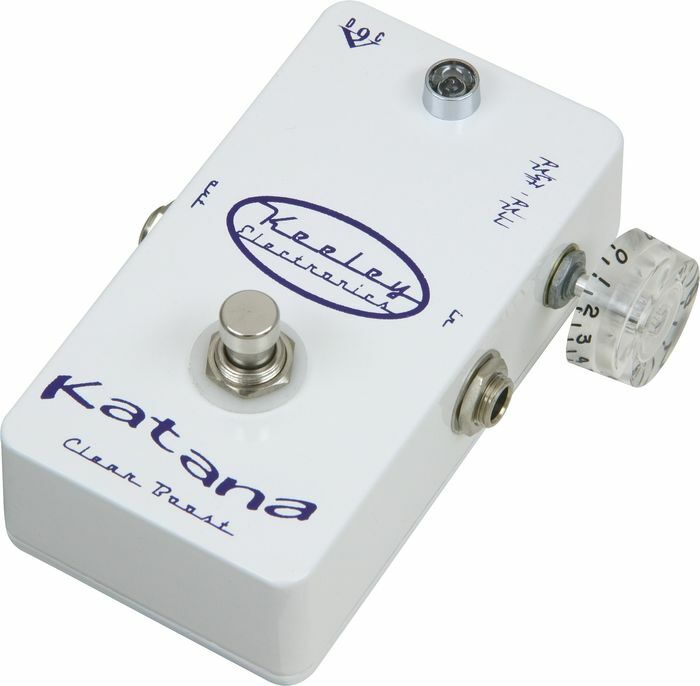 This pedal uses only 5mA of power when on (LED) and barely any power when off (under .2mA!) so the battery will last hundreds of hours. 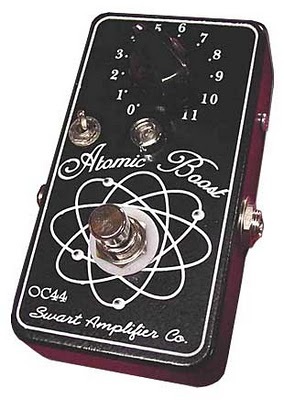 We usually run the BEANO BOOST directly into the input of your tube amp, with no buffers (i.e. tuners, or non-true bypass pedals) in the signal path. Most people have found they work best near the very beginning of your signal chain. Like the Fuzz Face, the Beano Boost MUST NOT have a buffered pedal in front of it. 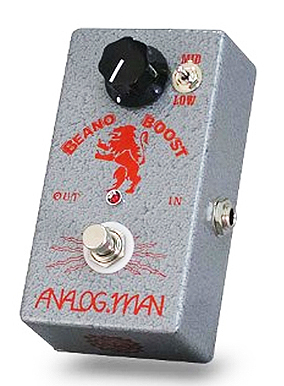 Something like a Boss pedal, even off, will make the Beano Boost sound VERY trebly and thin. Buffered pedals are OK after the Beano Boost if necessary.